Announcing the first episode of my Le Creuset Technique series! In December, in Charleston, South Carolina, while promoting my book, Ruhlman’s Twenty, I met Will Copenhaver and Grimsley Matkov, from the Marketing Communications team at Le Creuset US. They loved my book (and the many photos of the food we cooked in Le Creuset products, which Donna shot). I told them I love Le Creuset, it’s the best stuff on the market, that’s why we use it. 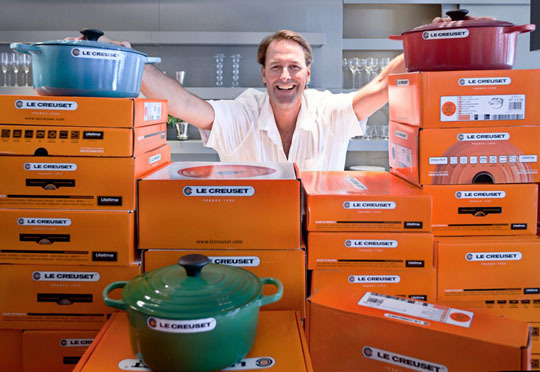 A month later, while cooking in Key West (brought my 7-quart Le Creuset French oven along with other tools, bien sûr), a colleague of mine, Warren Johnson, of Taste Five Media in Charleston, asked if I’d consider working with Le Creuset. I told him nothing would please me more, and Warren got to work. Le Creuset wanted to teach people how easy great home-cooking can be AND give away tons of cookware, arguably the best cookware on the planet (certainly none better). Would I come to Charleston to demo some of these pots and pans? We’ve put together six technique videos because I care about cooking, and having the right tools makes the cooking easier. They get to promote and give away their products. I get to cook! Here’s the first one: Baking great bread at home. It’s a fabulous technique. So many people use this method now, Le Creuset designed for its lid a special knob that can withstand oven temps up to 500˚F. For this episode alone, Le Creuset is giving away ten, that’s TEN, 7.25-quart round French Ovens, the vessel I use to make my own bread. (These are $300 pots, folks; well worth it, and they last for generations.) Read the recipe below or on the Le Creuset site before baking (note that you need to remove the lid halfway through the baking so that the crust gets that beautiful crisp golden brown). Each of the six episodes focuses on a particular technique, matched with one of their fabulous vessels to suit. The succinct entry form on this page has an optional box, asking for a cooking story, a cooking tip, a cooking nightmare. We don’t know what we’re going to do with what you write (have to see what we get), but I and Will and Grimsley at Le Creuset know that cooking is not a solitary activity, we do it as families (I hope! ), we do it with friends, we do it in communities. Food and story bind us together and keep us connected. And nourished. And healthy. And happy. Hope you’ll share a story, a recipe, a technique. Like my pal Nathan—a New York transplant but die-hard Browns fan, bless him—when his beloved grandma died, he asked for her Le Creuset pot. That’s all he wanted. Everything he needed to hang onto from her was bound up in that cooking pot. Ask him yourself on Twitter, @NathanSheffield. Or ask me. Will and Grimsley have requested that I answer cooking questions on Twitter, where I’m @ruhlman (which if you already follow me, you know I love to do). I’ll be watching for questions with the #LeCreuset hashtag. Combine the flour, water, yeast, and salt in the bowl of a stand mixer fitted with a dough hook. Mix on medium speed until the dough is smooth and elastic, 5 to 10 minutes. Depending on the size of the bowl, you may need to stop the mixer and remove the dough from the dough hook if the dough is not developing thoroughly. When the dough looks smooth, cut off a piece and stretch it. If it stretches to the point of transparency, it is mixed enough. If not, continue mixing until it will. Remove the bowl from the mixer and cover it with a pot lid or plastic wrap/cling film. Allow the dough to rise at room temperature until it has doubled in size and does not spring back when you push your finger into it, 2 to 4 hours. Turn the dough out onto a work surface and knead it to release the gas and redistribute the yeast. Shape it roughly into a ball, cover it with a towel, and let it stand for 10 minutes or so to allow the gluten to relax. Shape the dough into a tight ball—the tighter the better—by rolling it on the work surface between your palms. Coat the bottom and sides of a large enameled cast iron pot (5½ quarts/5.2 liters or larger) with vegetable oil. Put the dough in the center of the pot and put the lid on. Allow the dough to rise again, 30–60 minutes (less if it’s very hot and humid, more if it is cold). Gently rub 1 tablespoon olive oil, or more if you like, over the surface of the dough. Score the bread with a sharp knife or razor, making an X or a hash mark; this will allow the dough to expand freely. Sprinkle the dough with kosher salt. Cover the pot and put it in the oven. After 30 minutes, remove the lid, reduce the oven temperature to 375°F, and continue baking until the bread is nicely browned and cooked through. It should have an internal temperature of 200°F or so when done. Allow the bread to rest on a rack for at least 30 minutes before serving so that the interior finishes cooking. My post on making French Onion Soup from Twenty. A list of recipes from Le Creuset. Dorie Greenspan’s Chicken in a Pot recipe from the WSJ. Watch a video on how Le Creuset is made. Le Creuset is coveted in my house and I am single and cook alone! It’s great to cook with alone too! Le Creuset is the standard to which all other cookware aspires, I have owned some other brands but they never get used. I love, love, love my Le Creuset pots, but I have to say I am less loving of my 7″ fry pan. I can never seem to get it cleaned properly and everything sticks to it no matter how much fat I put in the pan! i’ll bet you’re not heating the pan enough before putting food in. no, definately heating it enough. my local LeCreuset salesperson thought I was heating it TOO much…so I backed off on the heat and still have the same problem! eggs seem to be the worst…cannot make an omlet in the pan at all and even scrambled eggs stick like crazy! I have a Le Creuset knockoff, I believe from Wal-mart (yikes! ), the brand is Tramontina. It’s nice, but the enamel has started to chip after five or six years. I could only imagine how much more resilient the real thing is. i’ve tried others too and they don’t come close. I LOVE Le Creuset. I have a Le Creuset tower at home and am always looking to add more. All of mine are in different colors: turquoise, orange, blue and yellow. I thought that you were going to post a no-knead recipe since so many people use Le Creuset for no-knead bread and were concerned about the handle melting. My biggest tip is to read the recipe thoroughly first if you are using a recipe and gather everything together before starting even if you don’t get into full mise-en-place mode. Most of my disasters have originated from skimming or not reading the recipe and forgetting an ingredient, step, or technique. Extremely versatile. Chili, stew, sauté, braise, roast, bake. What can’t Le Creuset do? Cooking is so much more enjoyable if you have two things: a great knife and a quality pan! I could use a french oven for so many things. So perfect for all the fall and winter dishes! My worst Le Creuset disaster was when I donated a beautiful Le Creuset pan to charity. What was I thinking??? I was young, stupid, and it was orange. Love the cool rise on the bread- works terrific with pizza dough as well- long cool rise! I’d give anything to have my Le Creuset back. Currently using a Knockoff (same color green) and it’s not nearly as good. Wish I could go back in time. Add beautiful color to the delightful smells of cooking ~ ah….. and the durability and versatility? FANTASTIC! We love to cook together. A friend never fails to comment on our “kitchen dance” as we waltz through meal preparation without getting in each other’s way. If you compare the Le Creuset to other enameled cast iron pots, it’s lighter. The cast iron is thinner. It’s still a heavy piece, but lighter than the others. I think the iron tempering process must allow this. Tempering also allows for higher heat during use without the expansion that would otherwise crack the enamel. I found my one Le Creuset 5.5qt pot at a yard sale. I snapped it up and have just loved it. I wish I could afford more pieces. I got mine from your OpenSky store. Love it. Fantastic for deep frying. My neighborhood loves my hot wings! yep, it’s the only pot I deep fry in. LOVE Crueset! Gave you my best amazing-meal-turned-nightmare-turned-amazing story. I love everything about my le creuset pan- My daughter’s friend dropped a lid on the floor and smashed the knob- where can I get a replacement? I have several name-brand pots and pans, but my two identical Le Creuset pieces are the ones I use daily. They are at least 10 years old and still look brand new. The hardest part about Le Creuset is deciding which colour to buy! My Le Creuset pots arrived just after my wedding 26 years ago, in a couple of very heavy boxes. I was using a set of latter-day Revereware, but found hot-spots – and they were too thin to do the kinds of braising and sauces I was discovering. I use my Le Creuset pots just about every time I cook – from oatmeal to chili to cacciatore to braised short ribs to soups and beyond. I adore my Le Creuset…. I’m lucky enough to have a Le Creuset and i absolutely love it! In our tiny kitchen it’s seen everything from stocks to matzo ball soup to Chinese braised pigs feet. More than a specific technique using my Le Creuset has taught me how to slow things down in the kitchen. I felt confident in my ability to whip up a quick impressive dinner but new to slow cooking I got a serious reality check; my improvisational approach to cooking made for some bland first dishes. Long story short I learned how building flavors and slowing things down (even when I improvise) elevates your cooking to a higher level. I’m a much better cook for it. Awesome video! That was a nice knife you had in your hand where did you get it? I saw a butter crock on the video. Can you actually leave butter out on the table in it,even during the summer in South Texas? We have central a/c and keep the house about 78 deg. To the people worried about the handle melting,Amazon has an S/S one for $12. Have to admit to buying a Lodge Enamled Cast iron D/O. The enamel started coming off not long after I got it. They repalced it for free..but. It was on sale at Amazon for about 1/5 the cost of Le Creuset..but! Yes, you can ! We have a Butter Bell (google it) brand crock. It uses a little cold water to create a vacuum seal. Works great, and we always have soft spreadable butter available. Sorry about the delay in responding. I may have to get the LeCreuset version next trip to Houston. I was there yesterday but didn’t have time to stop by. I actually gave a few of these to my sister because I didn’t have room for them all. And, unfortunately the big dutch oven was dropped a few times and cracked. I ended up finding an ebay replacement and purchased another small dutch oven as well. The thing I use them for most is for baking my bread. Ever since the Lahey method came out I began baking most of my bread in the big Le Creuset. I preheat the pot (I do remove the handle of the lid) in a 450 F oven for 30 minutes and gently plop the risen bread into the hot pot. It is so fail proof I cannot get over it! I even bake bread on my gas grill, with the middle burner off, front and back burners on med to med high. Works like a charm. I will often bake one big boule and two smaller ones (in the 2 qt. dutch ovens) at the same time. I even bake a batard style loaf in a lidded fish poacher (non- Le Creuset). Because of the constant high heat for the dutch ovens, the enamel has discolored some. I really don’t care- I USE these things all the time. That’s why I know it’s still worth it to buy the vintage stuff on ebay because it will last and last and last. One more thing- rice doesn’t stick or scorch when you cook it in a heavy bottomed pot. Rice cooker? Not necessary! And yes, despite the set that I have, I’d love a bigger big Dutch/French oven. There are definitely times when I’ve needed something larger than my 4.5 qt pot for braising/stewing. So thanks for the opportunity to enter the contest! that French Oven is the one piece of house ware we actually did battle over after my mother died and dad sold the house – I WON! It must be 45 years old and still works lie a dream showing little wear. As does the small, orange oval covered dish of my grandmother’s that makes the best macaroni and cheese – and that dish is from the 50s!!! i’ve never baked at high altitudes, so don’t know! I have owned Le Creuset for years. My first purchase was in early 1970s and like a previous contributor I bought a set that included a couple of sauce pans, and a couple of Dutch ovens and a small enameled skilled and a large cast iron skillet. I was fortunate to have a mom that went to cullinary school and was just a tremendous home cook. At the time, I was attending UCLA and my parents were living in London because of my dad’s work. Well I wanted to be able to make coq au vin and beef bourguignon…which is what led to my purchase of Le Creuset (orange color). Over 40 years later I am using many pieces on a regular basis. I also make bread in mine and you really do need the upgraded handle for the lid. As a side note: I now make Coq au vin using the recipe in Rhulman’s Twenty. Such a great cooking resource. LOVE the set of Le Creuset that I bought at a Sam’s Club in about 1985. I only paid $200 for a nine piece set. I use it all the time…passing over my son’s All Clad much of the time. If Le Creuset are so good ,how come I have never seen them in the kitchens of the many restaurants I have been to? Good Question Allan I don’t know the answer but it may have to do with either price or ease of use in a commercial kitchen. You sound like you have not cooked in Le Creuset in a home setting. They are durable, very easy to clean, and great for braising. I make bread in mine and it really does come out with a crust that is unbelievable. yeah, I think they’re just too expensive to have tons of them in the kitchen, though I saw little coquettes for serve in Charleston when we were there. Man, I’ve never owned one of these but have coveted for many many years. I use vintage cast iron but am always reluctant to cook anything acidic in it. I refer to my Le Creuset as “The Pot”. If the house was on fire I would save it and my Kitchenaid mixer. The Pot makes the best roast pork you ever put in your mouth. (2) Carrying it from Chicago to NYC on two connecting flights…completely worth it. The only thing better than Le Cruz is getting it from the outlet store in Harriman! My favorite Le Creuset memory is coming home after seeing ‘Julie and Julia’ with good friends and sharing a pot of Boeuf Bourguignon perfectly cooked and beautifully served in my 4.5 quart Cobalt Blue Le Creuset. This Le Creuset is a featured guest at most of my parties! My fiancee who back then was my boyfriend got me my first Le Creuset for my birthday… even after family and friends told him he was crazy in getting me a “saucepan” for my birthday. My guy knew what he was doing .. .when I open the gift, I fell in love with him all over again. Everytime I cook with it, I look at it and I break into a smile, and all of my food cooked in that “saucepan” (as my clueless family calls it) has been cooked with lots and lots of love. you found the right guy! I love my Le Creuset pot. Nothing like cooking up a batch of cassolet in one, wrapping it in a bunch of towels and a blanket for the car-ride to a friend’s house knowing that when you get there ( even if its an hour away ) it’ll still be hot and will have continude to slow cook and tenderize everything in it during the journey. Alright, I’ll be the turd in the punchbowl. I hate every last one of you right now. This post and contest have driven me to obsess about Le Creuset, though I have no way to afford a piece at the moment. My sister somehow finagled my mom’s dutch oven from her without me knowing, and they hate each other! Your stories fill me with envious rage. Fie on your happiness! I always think it’s best to enjoy a glass of wine while cooking. And also, splurge on fun gadgets and nice knives. It truly makes cooking that much more enjoyable. In 1974, about two years after getting married, my then-husband bought a red 5 qt. Le Creuset. When I left him 38 years later, the pot came with me. Some things cannot be replaced, like a Le Creuset. A husband on the other hand, can. A woman has to have priorities. Funny, and true! I have to watch myself! you use 4 different measures to indicate amounts. are the ounces in the recipe for weight or volume ? or can you give me a gram version. PS. i could probably give up anything i have in my kitchen except my Le Creuset. there are things i wouldn’t even know how to cook any other way. The flour is weight, the water is volume, the yeast and salt grams are weight. Confusing, isn’t it? wish it could all be weight, but it’s america. water is even ratio so 12 ounces is a cup and a half. I would love to win this contest since I personally do not own this wonderful piece of cookery. I really enjoy my Le Creuset, especially when I can make chili in one and a cobbler in another! I think Le Creuset is absolutely gorgeous but when I went to the store to buy a 5.5 qt pot it was just too heavy for me. And I knew it would really be too heavy when it was full of whatever I was cooking. I am not as strong as I used to be due to a muscle injury. So I purchased a ceramic Emile Henri flameware 5.5 pot instead. It goes from the stovetop to oven and cooks food beautifully and is highly recommended by Paula Wolfert. Her beautiful book, Mediterranean Clay Pot Cooking is definitely worth a look. My Le Creuset love affair started some years back, when I was changing jobs. My friends from the job I was leaving, gave me a Macy’s gift card, thinking that I would most likely buy a new suite for my new more official job. Little did they know, that I was secretly in love with a kiwi colored Le Creuset pot. Ever since I saw that pot I couldn’t stop thinking of it, I even had dreams of it sometimes. Once a week I would visit “my pot” when doing my regular shopping at the nearby grocery store, and would come home with an enigmatic look (which my husband took seriously at some point and I had to show him “my pot” to convince him it’s nothing more). A year went by before an offer to work for another company came with the opportunity to make more money. I took a job without hesitation, thinking not about challenges of the new job, but that I would be able to save for “my pot”. The Macy’s gift card from farewell lunch was a $50 short the price of “my pot”. For another month I visited “my pot” every week until I cashed my first check from the new job and one Saturday returned home with a oval dutch oven in kiwi color: I was all shining with a huge smile and as happy as a newly wed! I had the enamel ware off on one of the steak pans with the grill marks. I love the heavy pots for baking bread and brasing meat. Always easy to clean, when you think you’ve trashed the pan. I had a Kangaroo with a twist and three olives. I’m a big fan of gin, but if you want to taste the vermouth a Kangaroo is the way to go. It was pretty damm good, though I still prefer the cheap gin version, with cheap vermouth and GREAT olives. I grew up with what I think is Le Creuset – it isn’t stamped Le Cruset – bit looks exactly like it – it’s a French enamel cast iron and beautiful. We had a dutch pattern blue oval pot (my mother said it was a limited edition.) It went through a very bad kitchen fire and developed a crack in the top third. I still have it and use it for non soupy things. When my grandmother died I inherited her yellow oval pot. My husband bought me a 5.5 qt. round pot about 15 years ago for Christmas. That year I was making Julia Child’s stuffed goose with fois gras and prunes and had some part of it cooking in the pot when our power went out (electric stove) due to a very heavy snow storm – we ended up finishing the cooking on our charcoal Weber outside in 3′ of snow (I have pictures) – the pot was a godsend. It is absolutely my favorite pot and I would dearly love to have the larger one! I’d also like the smaller oval for petite veal roasts…perhaps I really need to ask for a larger kitchen…nah – I’ll make them fit! If I don’t have access to a stand mixer, would a hand-held electric mixer, kneading, or a combination thereof work instead? Or in general, is there no adequate replacement to a stand mixer with a dough hook? Takes just as long to knead by hand, and more fun. you just can’t walk away. Or try the no knead—recipe on this blog somewhere. Ooh! I just made pot roast in my Le Creuset dutch oven last night. Tonight we had the leftover meat, veggies, and gravy with a biscuit topping in a Le Creuset casserole/baking dish. I swear they retain heat better than anything else out there. Love Le Creuset but, like many others, wish it was more affordable! All my pots are Le Creuset, except the pressure cooker and the stockpots. It would be lovely to have the extra-large version. I’ve discovered the delights of potlucks (friends over – check, cook reasonable amounts – check, not have to obsess over the entire menu – check) and need to cook in larger quantities. Michael, I love my Le Creuset cookware. Have used it for years but never baked bread in it. Going to this weekend though! How about a Ruhlman App? I’ve had my sunflower yellow dutch oven for I bet over 30 years. My mother gave it to me before I was married. I’ve made the best French onion soup ever in that, spaghetti sauce, beef stew, bread — irreplaceable. I inherited a lovely cobalt blue one from my late MIL who was a great cook — we were rolling in Le Creuset. Then calamity — it fell on a cold winter frozen concrete garage floor and broke. I comfort myself with the sauce pan and fry pan I inherited from my mom. Heavy, durable and it makes you one great cook. My husband got me a 6 qt oval for my Birthday. I have been coveting it for almost 10 years! Now I’m obsessed! I have loved everything that has come out of it, especially the bolognese, and my brisket. Next, I want a sautee pan, then a gratin dish. A house is not a home without Le Creuset! It is so amazing for all types of cooking. My husband and I often cook together (fun) but we find ourselves arguing about who gets to use the Le Creuset. Recently it was over his garlic hot wings or my curried mussels for a cocktail party. He won. Our best dishes come from that pot! Love it!! I just discovered Le Creuset an now I’m hooked. How did I ever get along without it? I have two Le Crueset and one cast iron pot from Sur La Table. I have not noticed a huge difference between the two. One of my Le Crueset is at least twenty years old and still going strong. What do you think about the cast iron pots from other reputable retailers like Sur La Table as the price difference is significant. as long as it’s made by le creuset, it’s the same thing, so get the best price you can find. Can anyone tell me what color the green pots are in the video? They don’t seem to match any of the colors on the LC website. Is it a color specific to a retailer? I have just a white 7 qt now but want to expand and that color speaks to me. the color is fennel. I have and love. We gave a 5.5 quart pot as a wedding gift for two students who like to cook. I told them the pot is like a spouse: treat it right and it will be with you forever. Just made this bread – it is huge!!!! May 3/4 the recipe next time. My only problem is that the bottom crust stuck a little to the pan. More oil next time? Corn meal? Any reason why this happened, and what I can do to prevent the same problem again? maybe you’re pot not big enough, or you didn’t use a scale? as john below notes, you can put parchment paper on bottom for sticking issues. I haven’t had any but parchment doesn’t hurt. WOW!!! I finally have made the most gorgeous and crusty bread of my life!!! I have never had much luck making any kind of yeast bread and have tried other versions of the “Dutch oven” techniques. This is by far the easiest and best results; shatteringly crisp crust, highest rise and no worry over the water temp. My husband is still talking about how good it was and just pulled my 2nd loaf since yesterday out of my oven. I will definately be making it over and over again!!!!! Thank you- I can finally make REAL bread!!!!!! gosh, you’ve made me happy with this comment. and good for you! congrats! feels good, doesn’t it?! My bread came out FLAT. Help! My dough looked exactly like your’s after letting it rest overnight in the fridge. It was about 2″ thick. My only guess is that I didnt score it deep enough so it didnt rise as high. What do you think? It was still delicious & crusty. My husband and I couldn’t believe I made bread this good. Thank you! glad it tasted good, but I’d have to be there to know why it was flat. bread is a living thing! each loaf is different. I’ve been making Lahey’s no knead recipe for a few years now. I tried yours this weekend and have a few issues with the recipe as written on Le Creuset’s website. The amount of water states 12 ounces/300 milliliters. 12 ounces of water is actually 355 milliliters. Also my finished bread stuck – and I mean stuck as in ain’t going anywhere – to the bottom of my Le Creuset pot, even with plenty of oil on the bottom and sides as demonstrated in the video. I think a much better approach is to use a parchment paper sling as recommended by Cook’s Illustrated. Also I’m confused on the necessity of the stand mixer. Lahey’s recipe lets time do the kneading, so what’s the benefit of using the mixer if your recipe suggests letting the dough chill overnight anyway? It’s just something else to clean. Would love to hear your thoughts! Keep up the good work. we exchanged email but I should reiterate here that the metric to imperial measurements are translations, they are separate measurements. I use 500/300 gms flour/water because of the ease of metric. 20 ounces of water is more like 600 grams, thus more than 300 grams or 9 ounces of water.